Earlier this month The Future Heart​ reported Pink Floyd would be releasing an ‘Interstellar Overdrive’ vinyl 12” on Record Store Day, having confirmed from a music distributor it was listed as “180 Gram, previously unheard / unreleased recording from 1966, poster, postcard, limited to 4000, indie-retail exclusive.” That description was mysterious though. What exactly was this recording? Is there still legitimately “unheard” Floyd recordings worthy of issue? 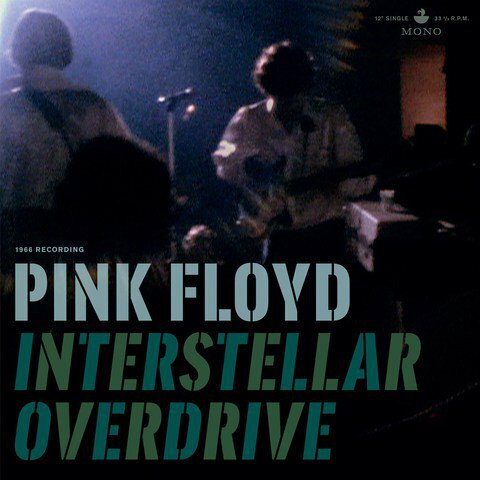 So there we have it: the ‘Interstellar Overdrive’ out next month was recorded November 31, 1966 at the Thomson studio in Hemel Hempstead, Hertfordshire. Obviously it wasn’t though: there are only 30 days in November. What then is the correct recording date? Referring to Glenn Povey’s Echoes: The Complete History Of Pink Floyd – which includes a day-by-day, encyclopedic log of every known Floyd concert, recording session, rehearsal, radio show, photo shoot, etc – there’s of course no entry for November 31, 1966. There is however an entry for October 31, 1966 (excerpt right) claiming the band recorded that day at…. you guessed it, Thomson Studio in Hemel Hempstead. Is it just coincidence? Possibly. But considering (A) it’s the only mention of that studio in the entire book, along with (B) the date in the press release is obviously wrong and (C) the similarity in the two stated dates, it seems most likely at some point there was a typo (or otherwise confusion) between 31/10/66 and 31/11/66. That the version in the documentary is the same length, was recorded at the same studio (when there is only one known Floyd session at that studio), on what appears to be the same day (despite the confusion over that aforementioned date and another non-existent date) strongly suggests the Record Store Day release is the version used in Stern’s film. If that’s the case, it’s not accurate to call it “unheard” (as various media outlets are, following the lead of the press release and Record Store Day listing) though this documentary is obscure enough – even among Floyd fanatics – that it practically is. If this version is known at all by Floyd fans it’s most likely as the track labeled “Interstellar Overdrive, 10/31/66, demo” on disc one of The Laughing Madcaps’ ten disc bootleg “Have You Got It Yet?” Certainly it’s never been officially released on vinyl (or any other format), just used in this rarely-seen film from which its been bootlegged. Perhaps October 31st wasn’t the exact date of this session. 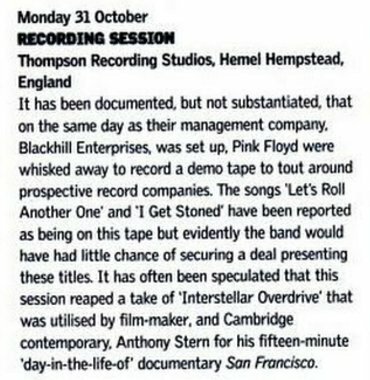 After all, whenever this session was precedes Pink Floyd having any notoriety, or even being signed to a label. There was thus no reason to keep records at this point; consequentially confusion over specific details are bound to happen. It’s to be expected that Povey would note the October 31st date “has been documented, but not substantiated.” But even if that date is off, all signs still point to the recording heard in San Francisco being the same version that will be released on Record Store Day. To reiterate in full disclosure, it can’t currently be said with absolute certainty that these two versions are one in the same (thus the asterisk in this article’s headline), but given the above detailed similarities it’s as close to confirmed as can be at this point. Either way, chances are you haven’t heard it and that needs to be remedied as it’s a fantastic 15 minutes voyage with Syd Barrett​ and The Pink Floyd…. 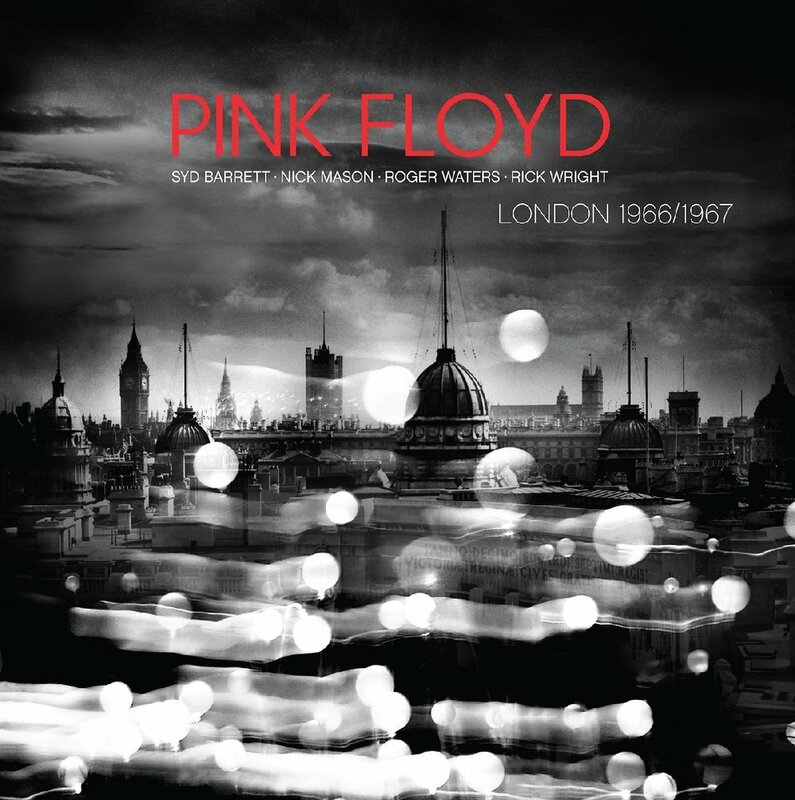 Pink Floyd’s London 1966-1967 is also out Record Store Day. Previously available on DVD, CD and very briefly vinyl, this new pressing marks its first time as a 12′ picture disc. Taken from the hippie flick cult classic Tonite Let’s All Make Love in London, it pairs a near 17 minute version of “Interstellar Overdrive” (listen below or click here to watch the scene from the film) on side A with “Nick’s Boogie” (click to watch) on the flip.